8 pp. Roman, 283 pp. This bibliography contains approx. 2,000 titles of linguistic relevance. Apart from linguistic studies in the concrete sense, the volume also includes original texts (fairy tales, proverbs, legends, etc. ), didactical texts for alphabetization, ethnological literature containing linguistic material, as well as some texts that are historically relevant for the localization of languages and peoples. The bibliography includes, apart from published material which is generally accessible, also a great amount of manuscripts and unpublished papers (grey literature). The entries are classified by the author or editor and contain key words referring to the contents as well as the languages and groups discussed in the text. Furthermore, some entries contain bibliographical annotations or cross references for other book titles. A language and subject index is also given in the bibliography. The list of the different language terms mentioned in the texts is added to the bibliography and contains approx. 1,500 entries. For each language term, the list mentions its source, its classification and, if possible, its etymology and gives cross reference to the term officially acknowledged or most commonly used in recent research. Each entry has its own code as well as a classifying number which guarantees an immediate identification. 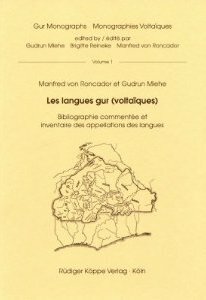 The bibliography provides a useful and extensive reference book for anyone interested in Gur languages.